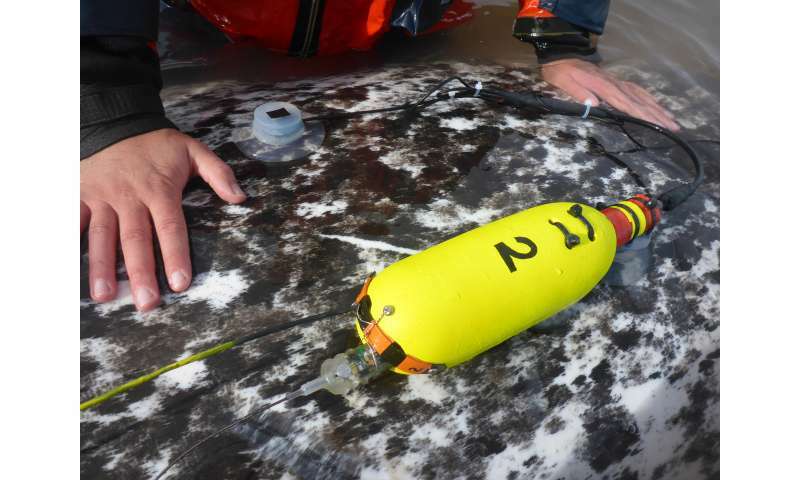 Narwhals released after entanglement in nets and outfitted with heart monitors performed a series of deep dives, swimming hard to escape, while their heart rates dropped to unexpectedly low levels of three to four beats per minute. This combination of hard exercise and low heart rate while not breathing under water is costly and could make it difficult for the deep-diving whales to get enough oxygen to the brain and other critical organs, according to a new study. "How do you run away while holding your breath? These are deep-diving marine mammals, but we were not seeing normal dives during the escape period. I have to wonder how narwhals protect their brains and maintain oxygenation in this situation," said Terrie Williams, a professor of ecology and evolutionary biology at UC Santa Cruz who has studied exercise physiology in a wide range of marine and terrestrial mammals. Williams is first author of a paper on the new findings published December 8 in Science. Narwhals, known as "unicorns of the sea" for the large tusks on the males, live year-round in Arctic waters. They have been relatively isolated from human disturbances until recently, when declines in Arctic sea ice have made the region more accessible to shipping, oil exploration, and other human activities. Narwhals monitored after release gradually returned to more typical behavior and normal heart rates. 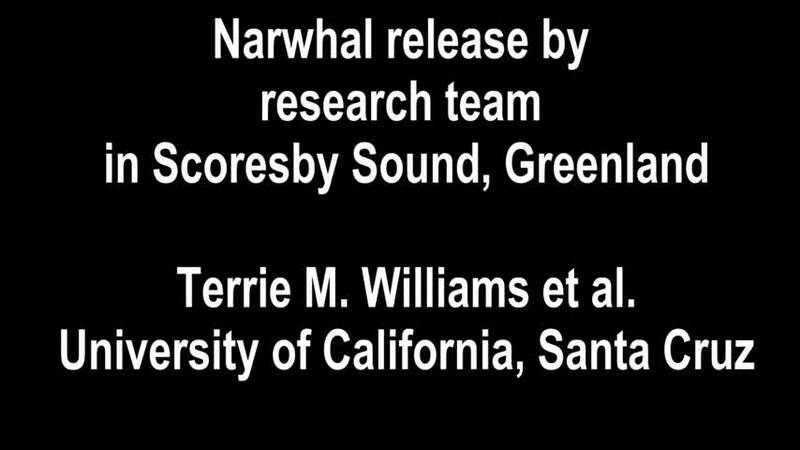 But Williams said she worries that the stress from human disturbances could cause behavioral responses in narwhals that are inconsistent with their physiological capacities. Their natural escape response to avoid killer whales and other threats typically involves moving slowly either to great depths or into shallow coastal areas beneath ice cover where killer whales can't follow. "This is not a speedy animal," she explained. A decreased heart rate (called bradycardia) is a normal part of the mammalian dive response, along with other physiological changes to conserve oxygen. In narwhals, the researchers measured resting heart rates at the surface of about 60 beats per minute. During normal dives (after the escape period), their heart rates dropped to between 10 and 20 beats per minute, depending on exercise level. Heart rate normally rises with increased exercise, even during a dive. "That's what is so paradoxical about this escape response—it seems to cancel out the exercise response and maintains extreme bradycardia even when the whales are exercising hard," Williams said. 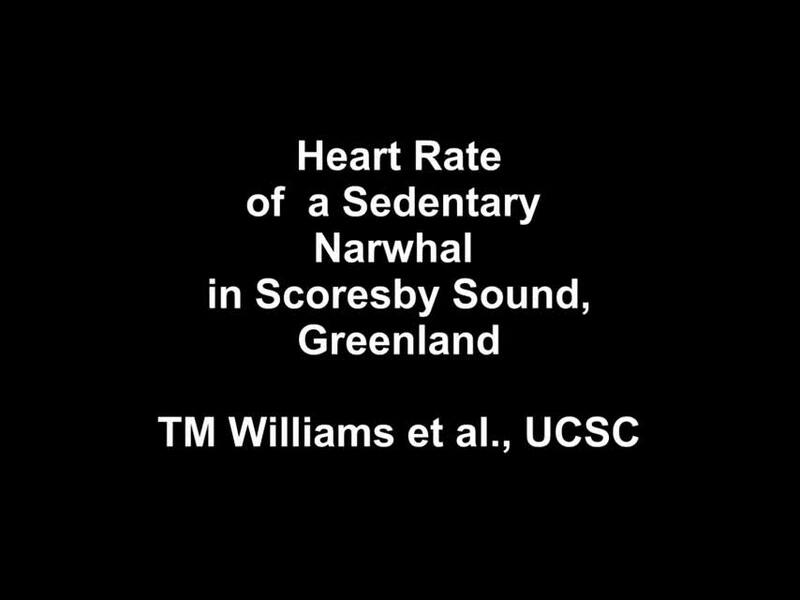 The extremely low heart rates that Williams observed in fleeing narwhals are similar to those seen in animals with a "freeze reaction," one of two mutually exclusive responses animals can have to perceived threats, the other being a "fight or flight" response that revs up heart rate and metabolism. The narwhals, in their response to a stressful situation, seem to combine elements of a physiological freeze reaction with a behavioral flight reaction, with potentially harmful consequences. "For terrestrial mammals, these opposing signals to the heart can be problematic," Williams said. "Escaping marine mammals are trying to integrate a dive response on top of an exercise response on top of a fear response. This is a lot of physiological balancing, and I wonder if deep-diving marine mammals are designed to deal with three different signals coming to the heart at the same time." The same phenomenon may occur in other deep-diving whales when they are disturbed by human-generated noise in the oceans, which has been associated with strandings of deep-diving cetaceans such as beaked whales, she said. "The disorientation often reported during strandings of deep-diving whales makes me think something has gone wrong with their cognitive centers," Williams said. "Could this result from a failure to maintain normal oxygenation of the brain?" She calculated that the escape dives her team monitored in narwhals required 97 percent of the animal's oxygen supply and often exceeded its aerobic dive limit (meaning depletion of oxygen stores in the muscles, lungs, and blood, followed by anaerobic metabolism). Normal dives of similar duration and depth used only about 52 percent of a narwhal's oxygen store, the study found. 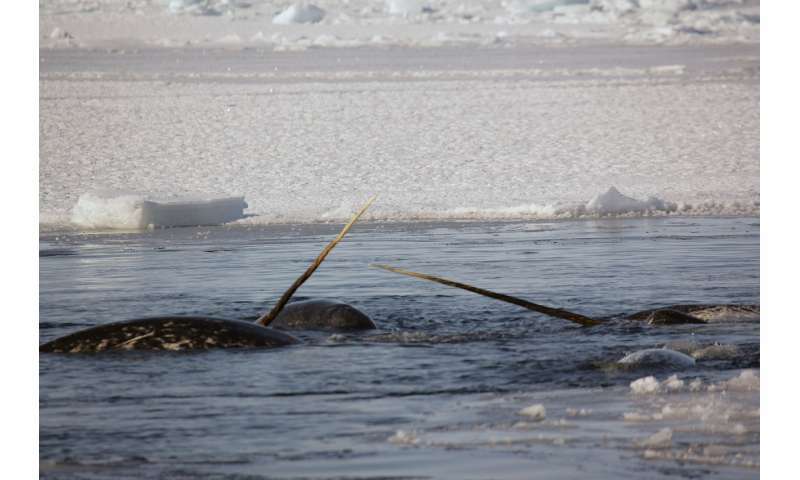 The study was conducted in Scoresby Sound on the east coast of Greenland, where coauthor Mads Peter Heide-Jørgensen, a research professor at the Greenland Institute of Natural Resources, has been studying narwhals since 2012. Native hunters in the area set out nets to catch fish, seals, and other animals, including narwhals. Heide-Jørgensen developed a collaboration with the hunters to allow scientists to tag and release narwhals caught in the nets. He has been using satellite tags to study the movements of the East Greenland narwhal population. Williams's group at UC Santa Cruz developed unique tagging technology for marine mammals that enables researchers to monitor exercise physiology during dives by recording electrocardiograms, swimming movements (stroke rates), and other data. The tags function much like the Fitbits people use to monitor their daily activities. For this study, resting heart rate was measured in nine narwhals, and five were monitored during dives after release. The instruments were attached to the narwhals with suction cups and fell off after one to three days, floating to the surface where they could be recovered by the scientists. In previous studies, Williams has used the instruments to study exercise physiology and dive responses in bottlenose dolphins, Weddell seals, and other species. "This was our first opportunity to put the tags on a deep-diving whale to monitor its physiological and behavioral responses," Williams said. "It all began with the work on dolphins in our facilities at Long Marine Laboratory." Among the findings of her earlier studies was a surprising frequency of heart arrhythmias in dolphins and seals during intense exercise at depth. The new findings add to her concerns about the effects of disturbances that cause an escape response in deep-diving marine mammals. "Unlike threats from predators like killer whales, noise from sonar or a seismic explosion is difficult to escape. Problems can start if the whales try to outrun it," Williams said. "The implications of this study are cautionary, showing that the biology of these animals makes them especially vulnerable to disturbance. This technology has given us a window into the narwhal's world, and what we see is alarming. The question is, what are we as humans going to do about it?"